The EDS16PR is the first rackmountable device server capable of delivering a data center-grade, programmable device computing and networking platform for integrating "edge" equipment into the enterprise network. 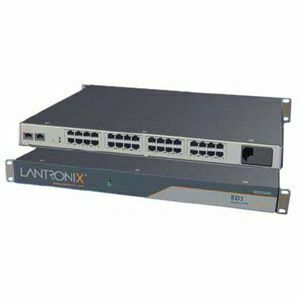 EDS16PR device server is ideal for remotely monitoring and managing serial-based equipment in diverse applications such as retail/POS, medical, security telecommunications, industrial and building automation. Featuring Evolution OS, the powerful real-time networking operating system, it delivers an unprecedented level of intelligence and security to networked equipment. With this innovative, versatile product, multiple electronic devices can become secure members of the corporate network that can be accessed and managed from virtually anywhere, at any time.